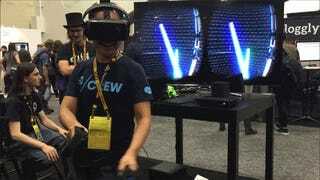 Anyone Up For Virtual Reality Lightsabers? Drawing crowds at this year's Game Developers Conference, this is motion control company Sixense's forthcoming STEM System for virtual reality motion control. It's working here with an Oculus Rift. The lightsaber demo is by no means Lucas/Disney-official, but it sure is an an enticing way to show what you could get if you combine VR with a good motion-detection system.